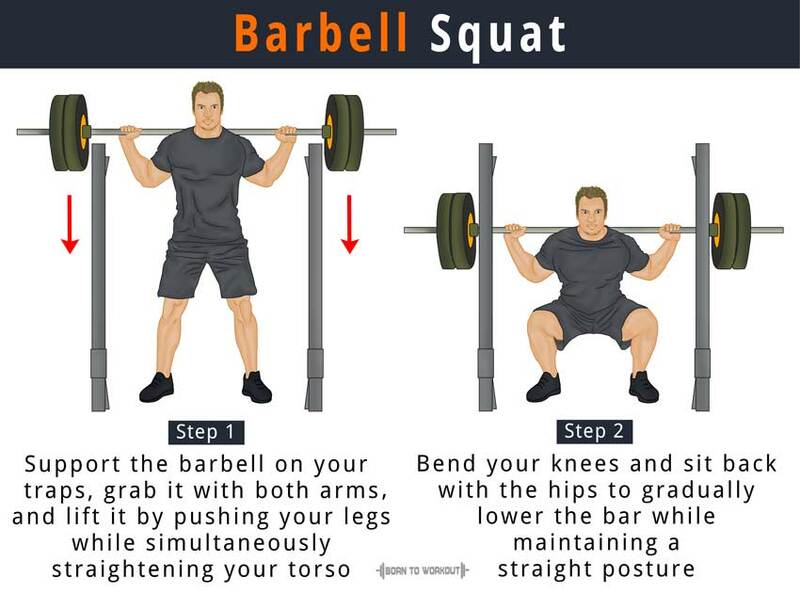 Doing squats with a barbell makes you exercise through a greater range-of-motion than most of the other squat types, which means it helps in building strength and gaining leg muscle mass effectively. While performing the barbell back squat, you can keep your trunk more vertical than other squat types because of the high bar position and medium stance. It improves flexibility and enhances the release of testosterone and growth hormones. First, adjust the bar on the squat rack so that it is above your shoulder level. Once you set the bar at the correct height, step under it and place your shoulders across it. Grab the barbell with both arms and lift it by pushing your legs while simultaneously straightening your torso. Move a few steps away and keep your feet at shoulder-width apart with your toes pointed out. Ensure that your back is kept straight and the head is up. This is your initial position. Bend your knees and sit back with the hips to gradually lower the bar while maintaining a straight posture. Continue the downward motion until your hamstrings touch your calves. Push the floor with your heel or middle part of your foot while straightening your legs and extending your hips to raise the barbell to the original position.